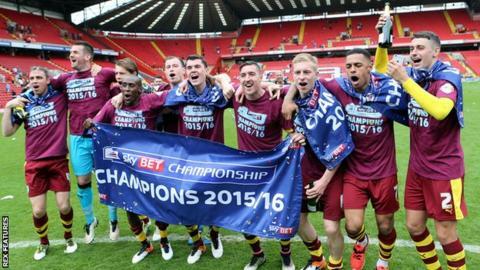 Burnley clinched the Championship title with victory over an already relegated Charlton Athletic side whose boss Jose Riga resigned after the game. The Clarets ensured an instant Premier League return by beating QPR 1-0 on Monday and match-winner Sam Vokes tapped in the opener after a fine move. Goals by George Boyd and Andre Gray wrapped up the win after the break. But irate Addicks fans were more concerned with their continued protests against owner Roland Duchatelet. Head coach Riga's resignation, just five months into an 18-month contract, came within 30 minutes of their 24th Championship defeat of a miserable season on and off the pitch. Charlton campaign group Coalition Against Roland Duchatelet said they were fighting for the "very soul" of the club and organised protests before and during the game, with numerous banners being unfurled and objects thrown on to the pitch. Fans prevented cars getting into the car park before the match and - although the club put up netting - beach balls, toilet rolls and various other items were hurled on to the pitch in the early stages. In the second half, with their side 3-0 behind, the anti-Duchatelet chanting increased and a couple of flares disrupted play. But the atmosphere among the home fans was in stark contrast to the travelling supporters, who were able to celebrate a 26th league win of the season. Middlesbrough's 1-1 draw against Brighton meant Burnley would have been assured of the title even with a defeat at The Valley. Despite riding their luck in the first period as goalkeeper Tom Heaton made excellent low saves to deny Johann Berg Gudmundsson and Callum Harriott, the Clarets ended up convincing winners. Stephen Ward had helped set them on their way before the interval, teeing up a simple 15th goal of the season for Vokes after a fine one-two with Scott Arfield. And Ward was also involved in the second goal, when his run and centre found Boyd who smashed the ball home from eight yards four minutes after the break. Gray added a third - his 25th of the season - when he made the most of his own poor control to race away and finish with a low strike across goal. Burnley's players were deprived of the chance to lift the Championship trophy at the end of the match because of concerns over crowd control at The Valley. But they celebrated with an inflatable replica on the pitch and will get their hands on the prize itself when it is presented at a civic reception at Burnley Town Hall on Monday, 9 May. The players will then carry the trophy on the open-top bus parade through the town at 19:00 BST. Boss Sean Dyche said the decision was "disappointing". He added: "But the main thing is we know. We don't need the medals. The medal is my brain. I know it is there. "This squad is ready to attempt to stay in the Premier league because it's a massive challenge." "It's not necessarily about going down to League One - and I am not a liar. I have taken this decision a few days ago. Even before that it was down to what I saw and could feel. "Everybody can recognise my investment in Charlton the first time I was here and this time. "It's not that I think I'm better than League One. You succeed in a season before the season when you have the right choices. But it's more than just about players - it's the club structure." Match ends, Charlton Athletic 0, Burnley 3. Second Half ends, Charlton Athletic 0, Burnley 3. Corner, Charlton Athletic. Conceded by Joey Barton. Attempt blocked. El-Hadji Ba (Charlton Athletic) right footed shot from the left side of the box is blocked. Assisted by Ademola Lookman. Corner, Charlton Athletic. Conceded by Tom Heaton. Attempt saved. Morgan Fox (Charlton Athletic) left footed shot from outside the box is saved in the top centre of the goal. Assisted by Yun Suk-Young. Attempt saved. Lloyd Dyer (Burnley) left footed shot from outside the box is saved in the bottom left corner. Assisted by Dean Marney. Substitution, Charlton Athletic. El-Hadji Ba replaces Ahmed Kashi. Substitution, Burnley. Michael Duff replaces Michael Keane. Substitution, Charlton Athletic. Yun Suk-Young replaces Callum Harriott because of an injury. Delay in match (Charlton Athletic). Substitution, Burnley. Lloyd Dyer replaces Scott Arfield. Joey Barton (Burnley) wins a free kick on the left wing. Corner, Charlton Athletic. Conceded by Ben Mee. Attempt blocked. Callum Harriott (Charlton Athletic) left footed shot from the right side of the box is blocked. Assisted by Ademola Lookman. Ahmed Kashi (Charlton Athletic) wins a free kick in the defensive half. Attempt missed. Igor Vetokele (Charlton Athletic) right footed shot from the right side of the box is close, but misses to the left. Assisted by Jordan Cousins with a through ball. Attempt saved. Igor Vetokele (Charlton Athletic) right footed shot from very close range is saved in the centre of the goal. Assisted by Morgan Fox with a cross. Alou Diarra (Charlton Athletic) wins a free kick on the right wing.